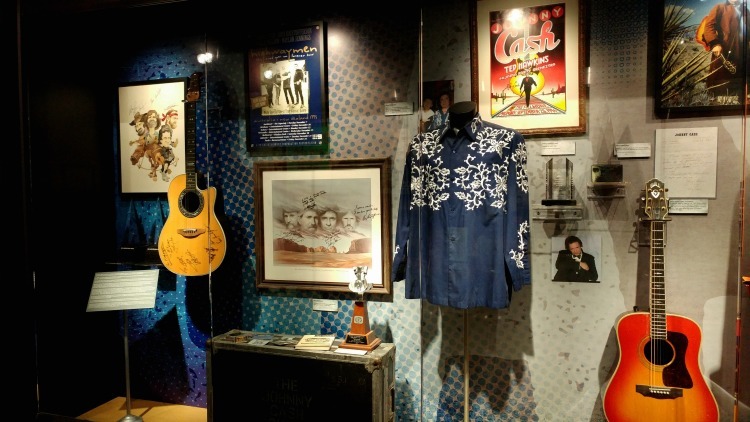 Clothing and instruments on display at the Johnny Cash Museum in downtown Nashville, TN. If you take a trip to Nashville, Tennessee, you’ll hear country music pouring out of the honky-tonks downtown on Broadway. While you’re there, take an opportunity to pay homage to one of the classic country legends that helped start it all. Johnny Cash embodied all of the well-known traits of classic country music: rebellion, heart, fame and pain. And the Johnny Cash Museum, within easy honky-tonk walking distance, captures it all. My in-laws traveled all the way from small-town Kansas to visit us in Nashville, Tennessee. It can be difficult to choose activities that make multi-generational groups happy. But one thing suited all of our small town Texas and Kansas roots right down to the ground: the Johnny Cash Museum in Nashville. Where is the Johnny Cash Museum located in Nashville? Smack dab in the middle of honky-tonk central, the Johnny Cash Museum can be found at 3rd and Broadway in downtown Nashville. It turned out to be a nice respite for us during a light rain, though we were on our way there anyway. If you are unable to visit during the week or on off times, expect a crowd. It is a smaller venue with several stations to listen to music and read detailed items, many of which are handwritten by the Man in Black himself. What Span of Time Does the Johnny Cash Museum Cover? 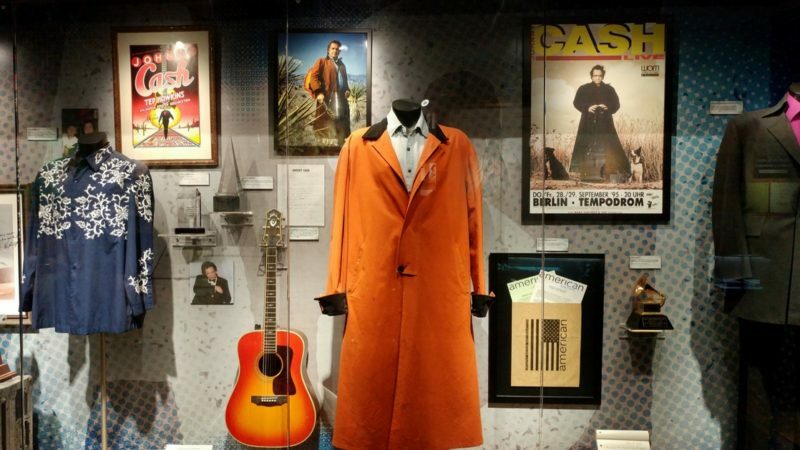 The museum spans Johnny Cash’s entire life. There are a lot of smaller, detailed items to see, like family pictures from his childhood, a school field trip post card, letters from his time in the military, a royalty check from Sun Records in the 1950’s, letters to June, multiple album covers and props from a music video released just a few months before he died. 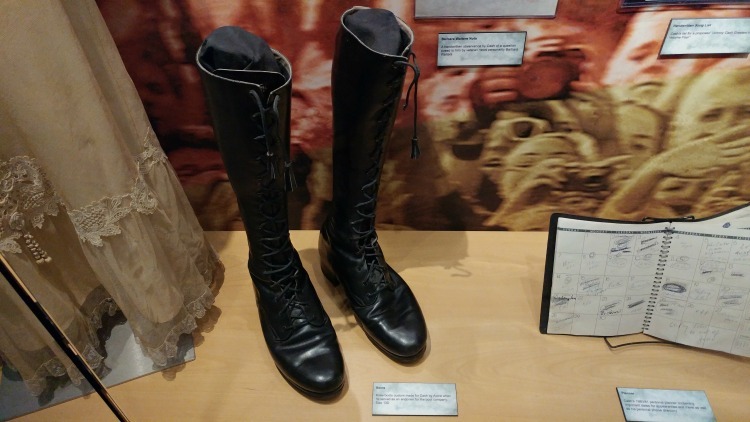 What Are the More Notable Items in the Johnny Cash Museum? Many of his signature stage outfits are in the museum. I got excited when I saw these knee boots, size 13D. Everything is carefully noted in case you recognize something and need a refresher about where an item is specifically from. 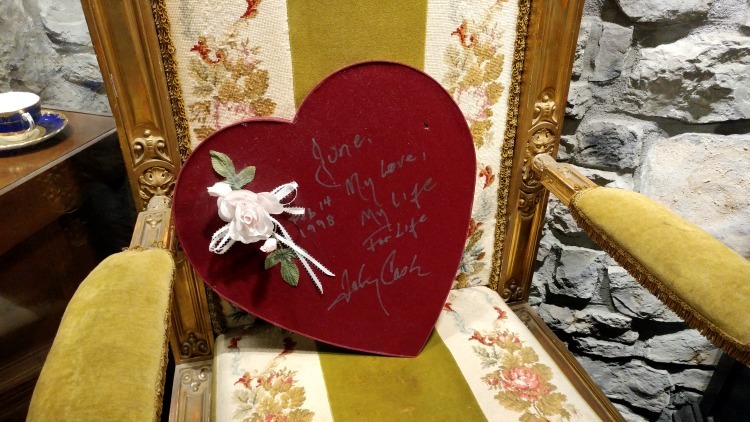 One of my more sentimental moments was seeing the furniture and stonework from Johnny and June’s lake house in Hendersonville, TN. Tragically, their home of thirty years burned down in 2007, 4 years after the famous couple passed away. The stonework is a cornerstone piece of the museum, carefully salvaged from the fire. I also noticed a heart-shaped felt box sitting in one of the chairs. It was a Valentine from Johnny to June in 1998. It reads “June, My love, My life For life Johnny Cash”. Is Anyone Else in the Johnny Cash Museum? 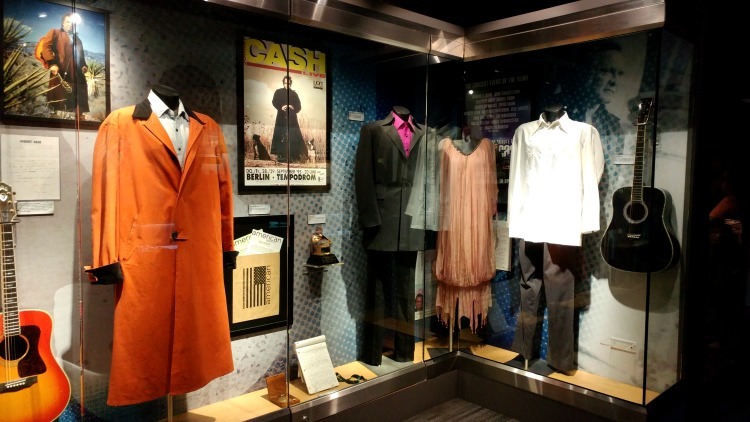 Accompanying many of Cash’s stage outfits are gowns from his wife June Carter Cash and the Carter family. The Man in Black shared the stage with countless other legends during his career, and they are also a part of the exhibit. 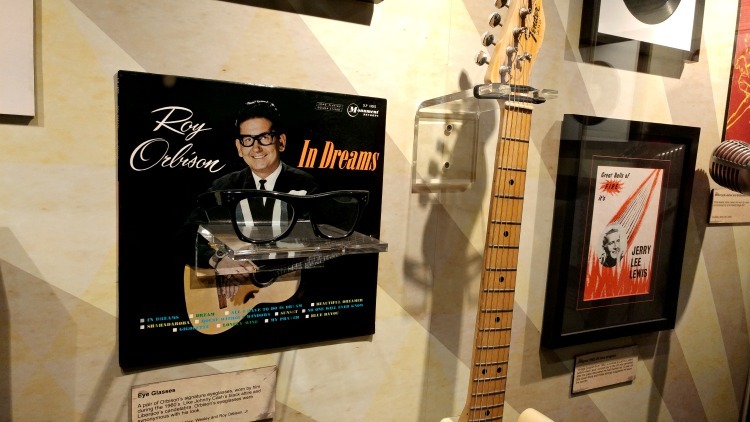 A pair of Roy Orbison’s signature eyeglasses is in a display case along with a pair of blue suede shoes worn by “Blue Suede Shoes” songwriter Carl Perkins. You can also find a white jacket worn by Elvis Presley and photos and instruments from Cash’s time with the Tennessee Two. Autographed pictures, programs, instruments and awards from the Highwaymen are also a crowd favorite. You may remember the Highwaymen as Kris Kristofferson, Willie Nelson, Waylon Jennings and of course, Johnny Cash. “Walk the Line” is the title of a famous song and the movie about Johnny and June’s life. Instruments and clothing used and worn by Reese Witherspoon and Joaquin Phoenix in the film are on display. 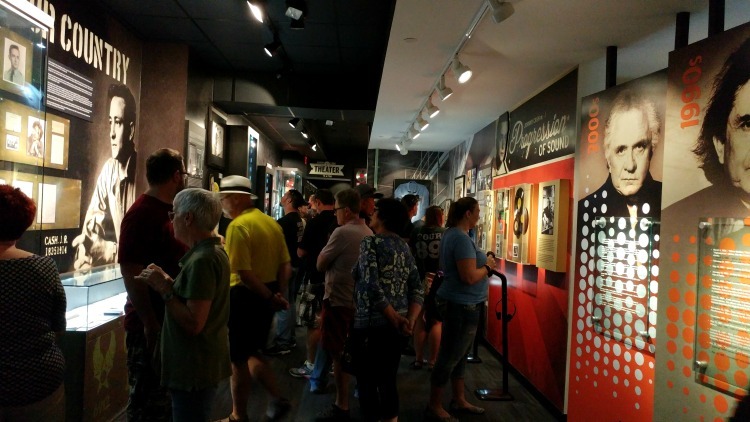 How Can Music Lovers in Nashville Beat the Crowds in the Johnny Cash Museum? Thankfully, there are 3 small theater-style sitting areas that play continuous video clips of performances if you need a breather. 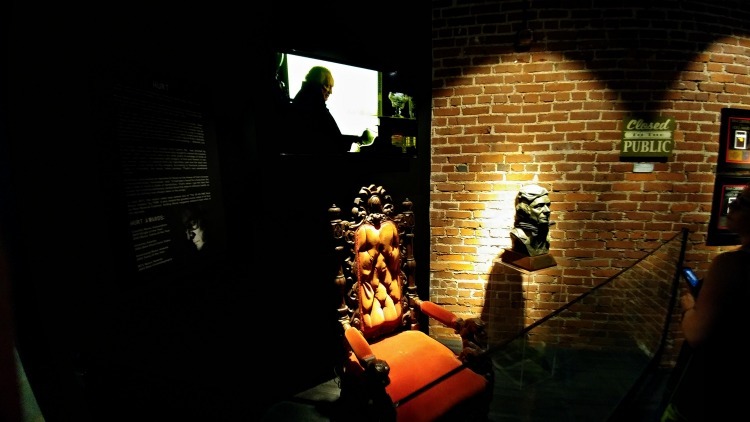 The staff does a good job of staggering guests for a short time behind a velvet rope before entering, but there are several listening stations at the beginning so it bottlenecks at the start. However, there is plenty to see and absorb and in my opinion, so it’s worth the wait. Additionally, the Johnny Cash Museum also has an on-site cafe and a Patsy Cline museum in the building for an extra fee. 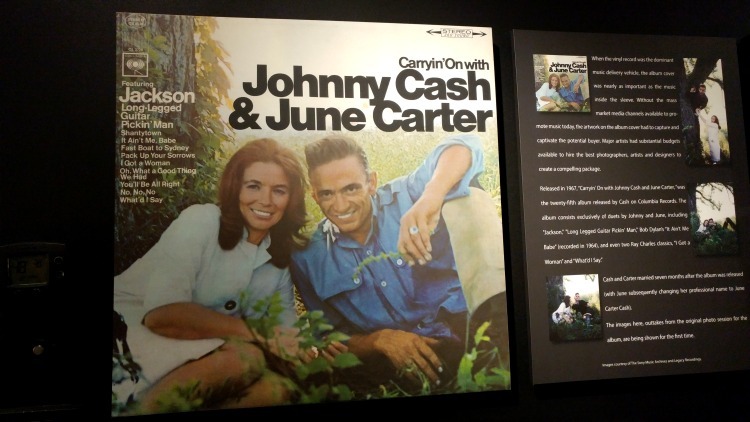 Does the Johnny Cash Museum End on a High Note? The museum ends on an emotional and thoughtful note, which is likely how Johnny Cash would have wanted it. The last thing you’ll see is one of the more well-known projects at the end of his life. The “Hurt” music video plays continuously with props from the filming. The video shows an honest image of all of the hurt, heartache, fame, love, and sadness he was always so open about, which was a fitting end to the museum. I felt compelled to stand and watch the video in its entirety, twice. It won Single of the Year and Music Video of the Year from the Country Music Association in 2003, the year he died. 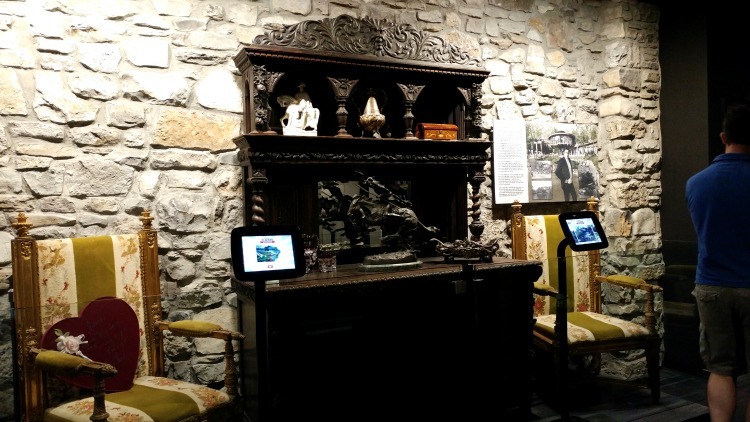 To see more pictures of what’s inside the Johnny Cash Museum, watch this short video. 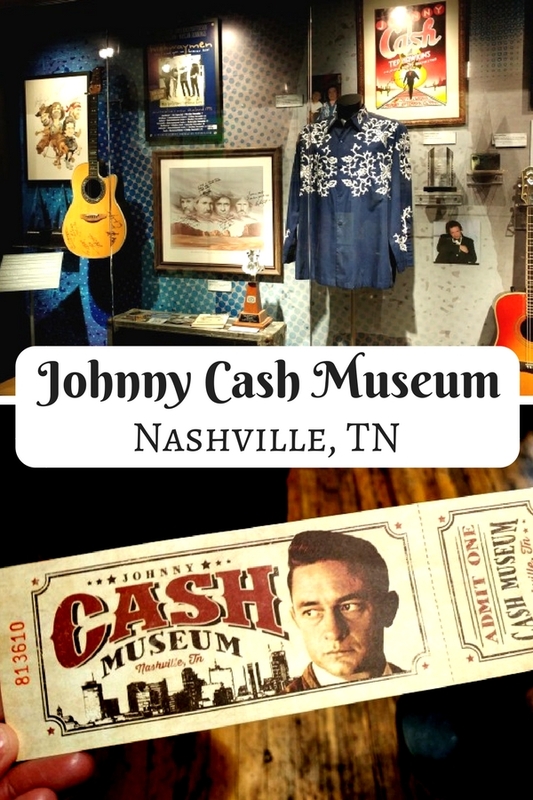 Have you visited the Johnny Cash Museum? What is your favorite memory of Johnny Cash? Share in the comments below.